The Mavs will play their second road game in two consecutive nights when they take on the Pistons on Thursday in Detroit. The Pistons (21-28, 13-12 home) have lost their last two games, and 4 of their last 5. Unfortunately for Detroit the Griffin – Drummond experiment is not working, despite Griffin`s best efforts, but that really isn`t much of a surprise for anybody. 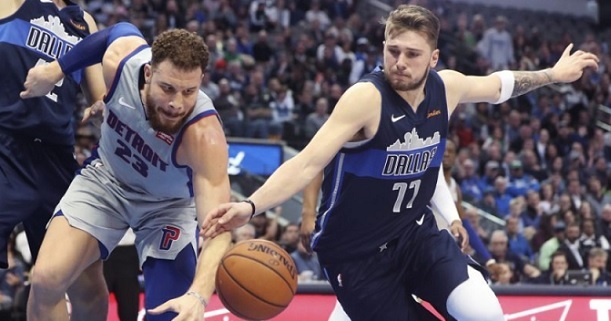 The Pistons are just an average team this year but still have a good shot to reach the playoffs in the weak Eastern Conference – and will hope to take advantage of Dallas being back to back here. The Mavs (23-27, 5-20 away) are coming after a blowout win in New York on Wednesday night, destroying the Knicks by 24 points. The Mavs have been in good form lately, capitalizing on a more accessible schedule (not an easy one) to win 3 of their last 4 games, only losing a tight one to the Raptors a few nights ago. The team looked good and sharp against the Knicks, even if star man Luka Doncic didn`t have a very good game. Bet on Pistons vs Mavs and get your 100% (120 Eur) welcome bonus at LSbet now! Team news: The Pistons will miss Ish Smith, while Reggie Bullock is doubtful. The Mavs only have JJ Barea (out for the season) unavailable, but it`s quite possible for Dirk Nowitzki to also sit out because of the back to back factor. Playing back to back on the road in the NBA is always bad news for the team in question, so it will not be easy for Dallas here, especially as there`s a long flight from New York to Detroit (1000 kilometers), and Dallas also has an abysmal 5-20 road record. However, that record is mostly due to a very difficult schedule away from home, and many of the losses were by just a few points. Against the East, Dallas has done very well overall, posting a 10-8 record. One thing which should make Dallas’ life easier is the fact that they blew out the Knicks last night. It was an easy win and not one single player played more than 29 minutes. This is a crucial factor which will diminish the impact of the “back to back” factor. The 2.5 point spread which the bookies opened with in favor of Detroit could be very valuable here. The Mavs are by far the best ATS team in the league, covering the spread in 62% (!!) of their matches, while the Pistons are in the bottom 10 in this category with a 45.8% rate of covering the handicap. The Mavs have also played more tight matches than anybody this season, and out of their 27 losses, 9 were decided by 5 points or less. The Pistons are also a team which often plays close games. The two teams actually met just a few days ago in Dallas, with the Mavs winning 106-101. The back to back factor must definitely be taken into account here, but the Mavs are the better team, are playing better basketball at the moment, and have much better morale coming into this game. They are really trying to make a push for playoffs contention now that the schedule opened up a bit for them, and they are on a good track. The fact that both teams, especially the Mavs, are so often involved in games decided by a handful of points, makes the + handicap on the visitors a tasty proposition. It gives a realistic safety net even if it may not seem that big at 2.5 points. My tip will be Dallas to cover the +2.5 handicap. Prediction: Detroit Pistons – Dallas Mavericks 104 – 108. Why did line jump from 2 to 5? Unfortunately news came out that Deandre Jordan and Luka Doncic are doubtful for the Mavs. Hopefully they will play (apparently there won`t be further news until close to game time). UPDATE: The Mavs have just made a trade so they will probably be without Matthews, Jordan and Dennis Smith JR tonight. Doncic still doubtful. Unlucky stuff but this pick is now done and dusted, only luck can save it.